Women in Germany won the right to vote in 1918, but a century later they still do not enjoy equal representation. Though the country is led by a woman — who will, most likely, be succeeded by another woman — fewer than a third of the members of the federal Parliament, the Bundestag, are female. That’s why leading figures from all major German parties are now calling for parity: a 50-50 quota for male and female representatives in the Bundestag and the 16 state-level parliaments. But is achieving a gender balance in Germany’s legislatures worth weakening another hard-fought accomplishment, the right to free electoral choice? This week the Parliament in Brandenburg became the first to require all political parties to nominate an even slate for state elections, starting in late 2020. The centre-left Social Democratic Party is pushing for a similar rule for national elections. The party is already informally enforcing such a rule in its selection of candidates for the coming European Parliament elections, in May, in the process overruling the results of local party votes. Most people can agree that equal representation in our elected bodies is a desirable goal. In a democracy, the people’s representatives should look like the people. Laws that put more women onto the field might look like a good start. And parity laws achieve that goal. “I am not a great fan of quotas, but I like the results they bring,” said Viviane Reding, a former commissioner of the European Union. But parity laws come at too high a price. Forced parity would turn unequal representation, at least in part, into forced representation. It would question voter judgment and pre-engineer a certain result. It would impair the freedom of parties to nominate their best candidates. It would install a discriminatory principle that could eventually swing back at the very group it aims to emancipate. Nor will quotas, in the immediate term, do anything to overturn the root causes of gender disparity in political representation. The problem, not only in politics, is an unlevel playing field for men and women. Thousands of years of patriarchy exert their influence in thousands of ways. First, we have to tackle those. For example, we should ask what keeps women from entering politics in the first place. Legislative sessions, from local councils to the Bundestag, are time-intensive and family-unfriendly, often running late into the night. And in German society, for all its pretensions to gender equality, a woman is expected to be the primary caregiver, while it is less acceptable for a man to tell his superiors that he has to go home earlier to get the kids’ supper or put them to bed. Men and women are entitled to care for their families equally if they want to. It is every man’s duty to make this clear to his boss. And, if his boss doesn’t listen, it is the job of legislators to help change the rules so that he has to. A second factor is unconscious bias. For instance, a deep male voice is often associated with authority, whereas a female voice has less social clout and gets easier talked over. Too often this becomes an onus on women. 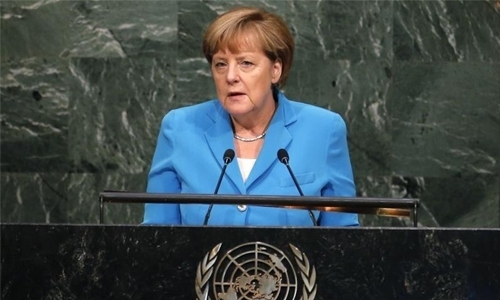 Recently, the German chancellor, Angela Merkel, stated that “for a woman, commanding authority is something she needs to learn.” Margaret Thatcher underwent special training to lower her voice. Can anyone imagine the opposite: a male politician striving to sound more like a woman because the power struggle demands it? There you go. Too many women see these informal but powerful rules stacked against them, and stay away from politics altogether. Unconscious bias can’t be legislated away. But it can be fought in the public sphere, through government and private campaigns to raise awareness of the unseen barriers that keep women from engaging in politics. In fact, Germany may be well on its way. Women already have proportionally more representation in the Bundestag than men, when compared with their political engagement: The share of women in the Social Democrats’ parliamentary caucus is 42 per cent, even though women make up 32pc of the party’s membership. The Greens do even better: Women enjoy a majority in the caucus, while they make up 40pc of their membership. Merkel’s center-right Christian Democrats, the largest party in the Bundestag, perform less well, with about 25pc in each category. Yet the party has been led by a woman, Merkel, for 19 years, and in December it passed over two men to elect another woman, Annegret Kramp-Karrenbauer, as its new leader. In other words, absent a quota, Germany is not about to reach gender parity in politics, but it is steadily moving in that direction — and will make even more strides if, in the meantime, it tackles some of the underlying issues keeping women from entering the field in the first place. One of the virtues of a gender-blind democracy, like the one established under Germany’s postwar Constitution, is that we can let these social changes play out as far as society wants. It’s not hard to imagine a day when the makeup is flipped, and women constitute 70pc of the Bundestag. And that, above all, is the problem with quotas. I asked one of its proponents, a young Social Democrat named Kevin Kühnert, if his party’s parity rule would allow it to put up more than 50pc women as its nominees. No, he said — it had to be 50-50. This is where the idea comes back to haunt its inventors. I had always thought that equal opportunity for women meant something else.